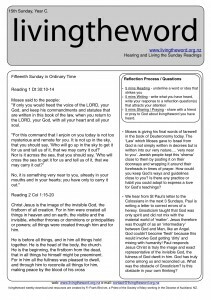 11th Sunday – The Church, glorious tree or medicinal small bush? Ezekiel is different because he was both a Priest and a Prophet. He was with God’s people when they were deported into Babylon enduring suffering and slavery. They were without a Temple, their Land, a King. In a time of great distress he is humbled to realise that very few people listen to him (and God) and even less respond with obedient living to God’s ways. He shares an image of a ‘snip’ of a great tree, a ‘faithful small remnant’ of people will be planted by God in Jerusalem. So deeply does he believe in God’s guidance of history he repeats ‘the Lord will do this’ 86 times. Would you consider yourself part of God’s ‘tender shoot’, faithful and obedient? The tree (Church) of God will include all types of birds and winged creatures and the ‘lowly’. How inclusive are you toward others? It is important to understand St Paul. Our bodies are good but there is a ‘desire’ in our flesh that is deeply selfish. A christian disciple lives and walks by ‘faith’ not by ‘flesh’. Jesus guides our life and choices not the selfish desires many in the ‘world’ chase. Is your ‘home’ in Jesus or the ways of the world. Paul encourages disciples to face this tension and question head-on. Imagine an examination of your life at the end of time: What did you live for? What was your heart attached to? Jesus very early on in the Gospel of Mark meets great resistance. His family think he is ʻout of his mindʼ and religious leaders from Jerusalem suggest he is possessed by a demonʼ (Mark 3,20). It does not look like Jesus is having much success. Have you met resistance from family and people in leadership? How did you cope? What did you hold on to so as to continue your call and purpose? Jesus shares a story of the mysterious and silent working of God in bringing the ʻKingdomʼ. Just as farmers presume something is happening to a seed under the ground, we also need to trust not always by sight but what we know. In truth, the mustard seed only grows to a 4 foot ʻbushʼ! Are you expecting Church to be a magnificent Cedar tree and struggle with the reality of a stumpy ʻbushʼ? Is Jesus suggesting a change from strong and powerful to humble and ʻmedicinalʼ? The mustard-seed was considered to be a medication for many ills. The topic most frequently talked about by Jesus was the ʻKingdom of Godʼ (Kingdom of Heaven). He chose to use parables to describe ʻGodʼs waysʼ. Parables trap us. We agree with some parts of the story but resist or donʼt want to agree with other parts. We reject it, or open ourselves to an opportunity of a new way of understanding (conversion). Why did Jesus choose to describe the Kingdom as a mustard seed. We like the idea of many birds finding shelter and the church ʻwelcoming and includingʼ all people. But a ʻmustardʼ seed and bush was a backyard weed, very stubborn and difficult to get rid of. Is the way of God really requiring a revolution? Who gets threatened by that? Do you prefer the status quo or an inclusive change welcoming the poor and marginalized? What is one action that you will do to be ʻlivingthewordʼ this week? Download Feast of the Dedication of Lateran Bascilica. The celebration today marks the oldest of the major churches in Rome and the Church which belongs to the ‘Bishop of Rome’ (many people may think it is St Peters). Today we have an opportunity to reflect on the significance and meaning of ‘Church’ as a building and also as a ‘people’. The Prophet Ezekiel was also a Priest and was in the first group of Israelites to be taken away from their homeland and put in exile in Babylon. This passage is a prophecy and a reminder from God just how special the ‘Temple’ and ‘Jersualem’ and its people are in the world. Jersualem becomes an image of God’s people. The Temple becomes an image of the Parish / Church today. What does it mean for the ‘church’ to be like life-giving water flowing out into the world, making everything ‘fresh’, and the fruit and leaves produced being ‘medicinal’ for the world? St Paul has a deep experience of linking the temple to each disciple. We have become the ‘meeting place’ where people can experience God. Do you know God dwells in you? Do you know the ‘temple of God, which you are, is holy’? One of the first public actions by Jesus in the Gospel of John is to ‘cleanse’ the temple. ‘My Fathers house’ is said 27 times in the Gospel of John. It was an expectation of the Messiah that when he comes he would ‘cleanse the temple’ and restore it to become really and truly a proper house of God. Jesus sees sheep and cattle and money changers turn the ‘house of God’ into a market. When you look at the Church, what do you see? What upsets you? What would you like to ‘cleanse’? Some scholars share that the actions of Jesus are very significant. Jesus does this action at the time of the ‘passover’. He replaces the ‘temple’ with his own ‘body’. On the second Passover he replaces the ‘passover’ with the ‘bread of life’ (John 6). On the third Passover Jesus sacrifices his body on the cross, instead of the Passover lamb in the temple to be the ‘sacrifice that takes away the sins of the world’. If the temple was the place to ‘meet God’, can you recognise how we now meet and become one with God in the Eucharist celebrated at Mass? Is the building special or the celebration that takes place within it more special? What is one action that you will do to be ‘livingtheword’ this week? 11th Sunday Yr B – Is the Church a cedar tree or mustard bush? Jesus very early on in the Gospel of Mark meets great resistance. His family think he is ‘out of his mind’ and religious leaders from Jerusalem suggest he is possessed by a demon’ (Mark 3,20). It does not look like Jesus is having much success. Have you met resistance from family and people in leadership? How did you cope? What did you hold on to so as to continue your call and purpose? Jesus shares a story of the mysterious and silent working of God in bringing the ‘Kingdom’. Just as farmers presume something is happening to a seed under the ground, we also need to trust not always by sight but what we know. In truth, the mustard seed only grows to a 4 foot ‘bush’! 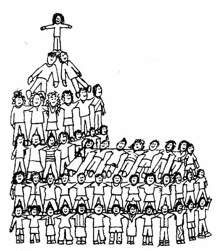 Are you expecting Church to be a magnificent Cedar tree and struggle with the reality of a stumpy ‘bush’? Is Jesus suggesting a change from strong and powerful to humble and ‘medicinal’? The mustard-seed was considered to be a medication for many ills. The topic most frequently talked about by Jesus was the ‘Kingdom of God’ (Kingdom of Heaven). He chose to use parables to describe ‘God’s ways’. Parables trap us. We agree with some parts of the story but resist or don’t want to agree with other parts. We reject it, or open ourselves to an opportunity of a new way of understanding (conversion). Why did Jesus choose to describe the Kingdom as a mustard seed. We like the idea of many birds finding shelter and the church ‘welcoming and including’ all people. But a ‘mustard’ seed and bush was a backyard weed, very stubborn and difficult to get rid of. Is the way of God really requiring a revolution? Who gets threatened by that? Do you prefer the status quo or an inclusive change welcoming the poor and marginalized?